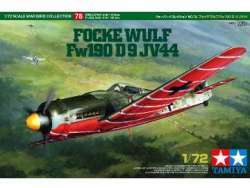 High-quality 1/72 scale assembly kit of the Focke-Wulf Fw190 D-9. Sleek long-nosed form of the formidable fighter accurately reproduced. For the first time in a 1/72 War Bird Collection model, a pilot figure is included. Large decals included to depict the distinctive underbody stripe markings of the JV44 aircraft. Markings are for one of two aircraft from JV44, Red 1 or Red 3.